To setup inventory adjustments go to Company Settings/Inventory and select a default GL account that adjustments should be posted to. This should be a cost of goods account that writes off the inventory. There is also an optional setting to post a markup percentage on inventory transfers. Usually an income account is selected so that inventory is debited for the increase and the income account is credited. This feature is used when head office wants to add overhead for stocking inventory. The warehouse that the goods get sent to will then realize a higher cost for that item that the main warehouse. This higher cost is offset by the transfer so the companies bottom line does not change. Inventory adjustments can be reached from 2 places in Spire. From the inventory list the user can highlight the items to be adjusted or transferred and then click the adjustment button on the top of the inventory list. The transfer option is selected by clicking the little arrow in the adjustment button. The other way to reach adjustments is via the top menu under Inventory/Inventory Adjustments. Click the + button and choose ‘Adjust Inventory’ or ‘Warehouse Transfer’. Save – Saves the adjustment and assigns a number. The items on this list have now been put ‘In Transit’. This means that they have been committed in the warehouse. In the case of a warehouse transfer, the items in the ‘from’ warehouse get committed, and the items in the ‘to’ warehouse get set as ‘On-Order’ just like when they are on an issued purchase order. 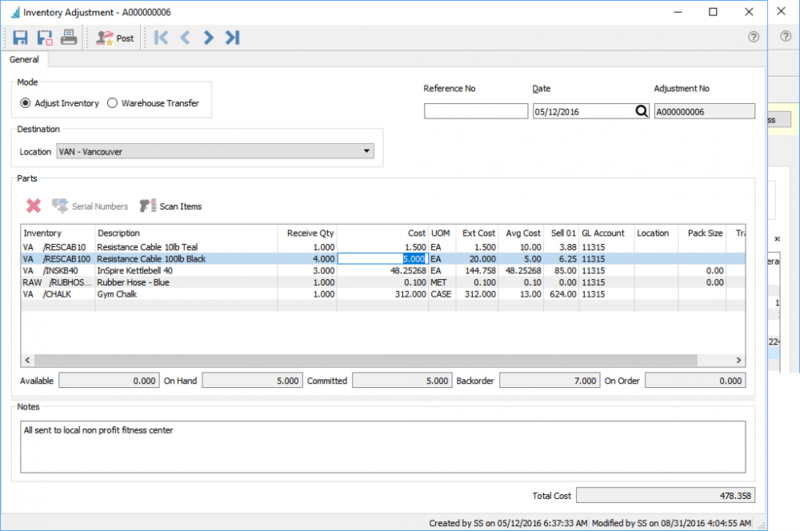 Save Close – Same as saving but it closes the adjustment and shows the list. Post – Posts the adjustment/transfer. The items are removed from the ‘in transit’ state and are posted as receipts. They also get posted to the purchase history table using the adjustment or transfer number as the PO number. This way a user can review and print past adjustments. *NOTE: When an item is highlighted the status of the item shows just below the grid. Scan Items – Use this option to scan items one at a time. Users can also directly scan serial or lot numbers and the item will also get populated. Sell 01 – Sell price 1 from inventory. This can be edited and it will update inventory. GL Account – GL account that this line will post to. The inventory GL account for the sales department of this item will always be used for the transaction as well. Location – The warehouse location for this item. This can be edited and it will update inventory. Pack Size – The pack size that this item is in. This can be edited and it will update inventory. Transfer % – The percentage to charge to the GL account that was setup in Company Settings/Inventory. Notes – Notes can be added for this adjustment and will be save as a communications note in purchase history. Total Cost – Total cost of the transfer.